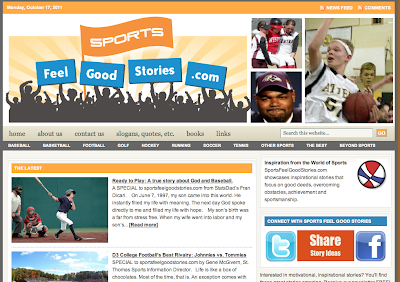 So if you are serious about starting a youth sports blog here are the first steps. 1. Pick a topic that you are passionate about. 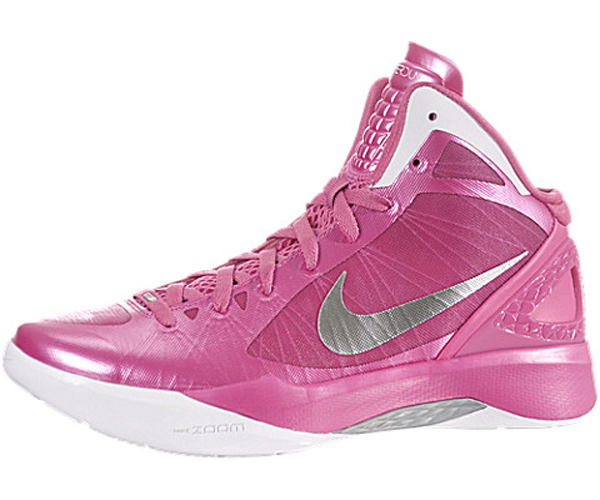 I write about youth sports in general, but I focus on select baseball, soccer, golf and basketball. These are the sports my kids play and therefore the topics that I have the most passion and content for. 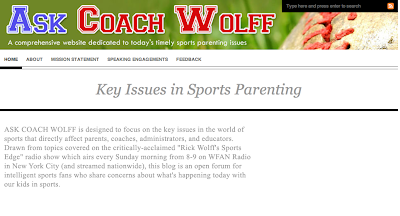 Here are some examples of other youth sports blogs with a specific focus: Coach Parker writes about youth football, Hockey Mom in Canada writes about youth hockey in Canada. 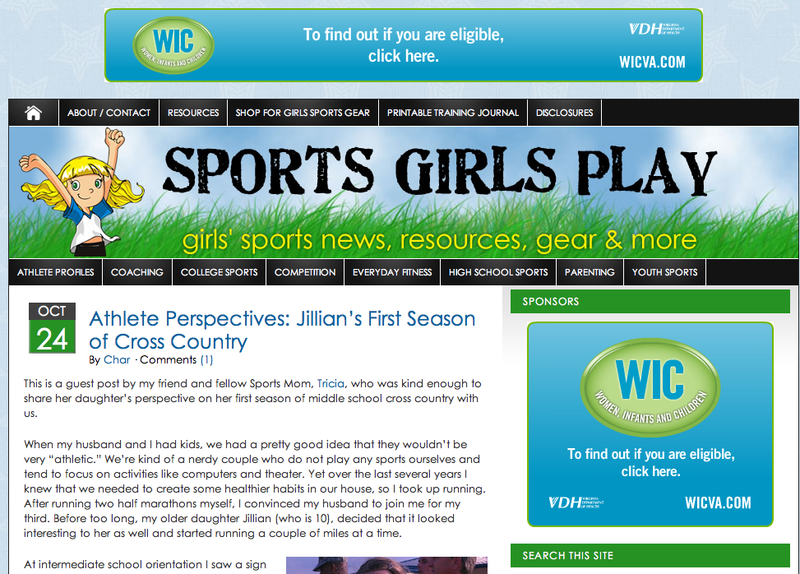 Sports Girls Play focuses on girls in sports. 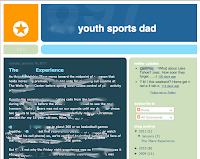 Before you start your blog, I recommend that you explore many youth sports sites to see what you like and what you don't. Start by exploring the blogs on the blog roll on the right column of this blog. 2. Pick a name for your site and see if it is available. One of the most important things you need to do is to select a name for the site. You'll need a name that will set your site apart from the crowd. Find a name that reflects the subject and the personality of the site. 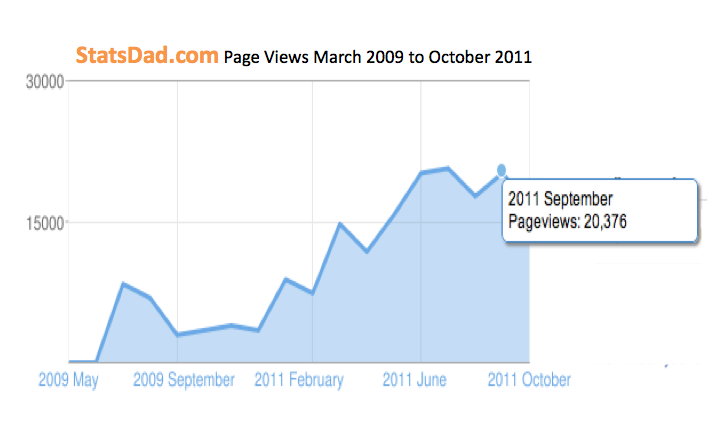 If you are serious about blogging, you'll want your own URL, like www.statsdad.com. It is not very expensive to do (less than $10 / year). 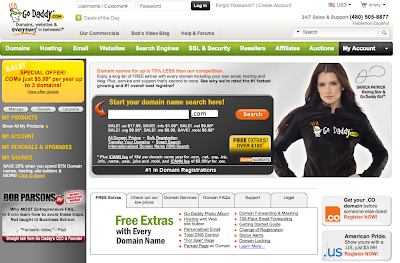 To get your own URL, you'll need to go to a URL Registry Service like GoDaddy.com, NetworkSolutions.com or Register.com and check to see what names are available and register for that URL. 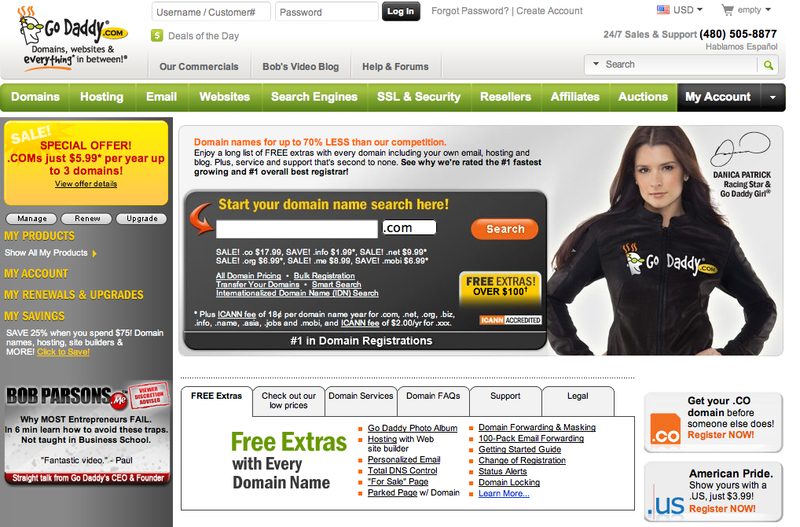 If the name you want is taken, these websites will suggest alternatives. I would recommend that you use a URL with a .com or .net ending. These are the most common and therefore make your site look more authentic and credible. 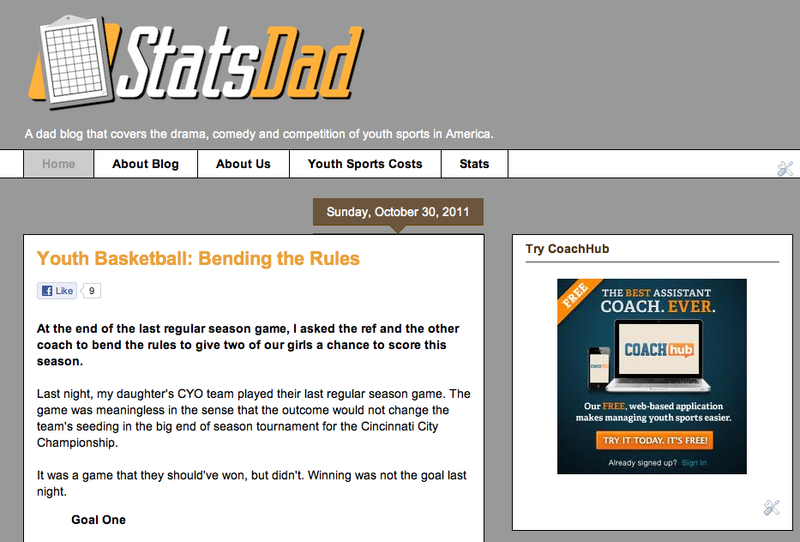 I choose StatsDad.com because I keep the score books and team stats for the sports teams that my kids play on. 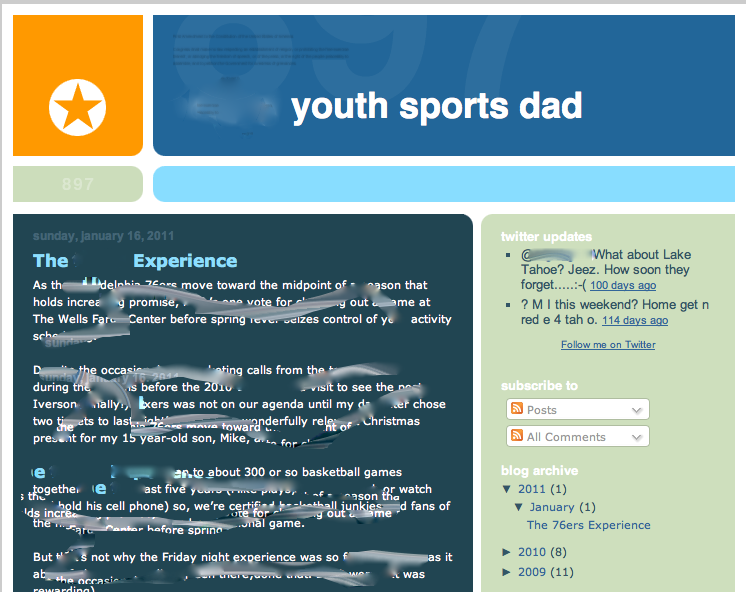 Dad blogs are getting big so I wanted the word Dad in the title. If you do not want to pay for a URL, you can simply use the URL associated with the blog platform that you decide to use (See next section). 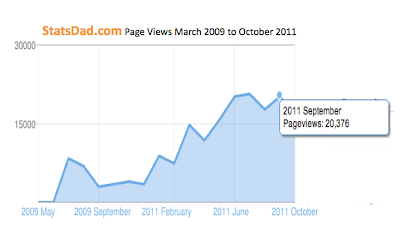 In that case your URL would look something like this; www.statsdad.blogspot.com or www.statsdad.wordpress.com. You can start with one of the URLs that come with the blog platform and then change to your own URL later. I think that you'll agree that the owned URL looks more professional and credible. I recommend using Google Blogger (www.blogger.com), Wordpress (www.wordpress.com) or Typepad (www.typepad.com). 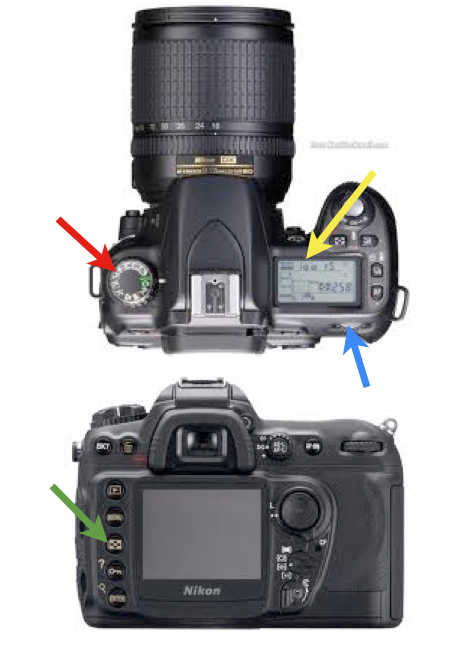 All three are very easy to set up and use. Both provide intuitive step by step directions to guide you through the process. You can literally be up and running in less than 10 minutes, but you'll want to take some time designing the site. The design of your site is one of the most important decisions you can make. A good design will make your site look credible and authoritative. A good design will make the site easy to read and navigate. Always think about the end user, your audience. Each platform above provides many design templates from which to choose. Pick a template that fits your subject and your personality. Use the template features to make the site look new and different. Experiment with custom templates, colors and fonts. Avoid the cookie-cutter design templates. 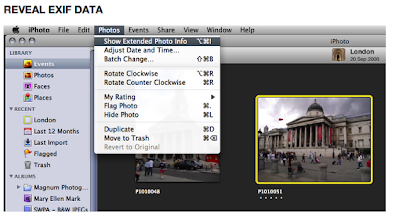 You can change the look of the site with a click of a button and then switch it right back. Use colors and fonts that are easy to read. Avoid dark backgrounds with light type. Playing Time Dilemma - What do you think? I am the assistant coach for my daughter's 5th grade basketball parochial school team. The head coach is out of town and we have a big tournament game tomorrow. We have 10 players on the team. 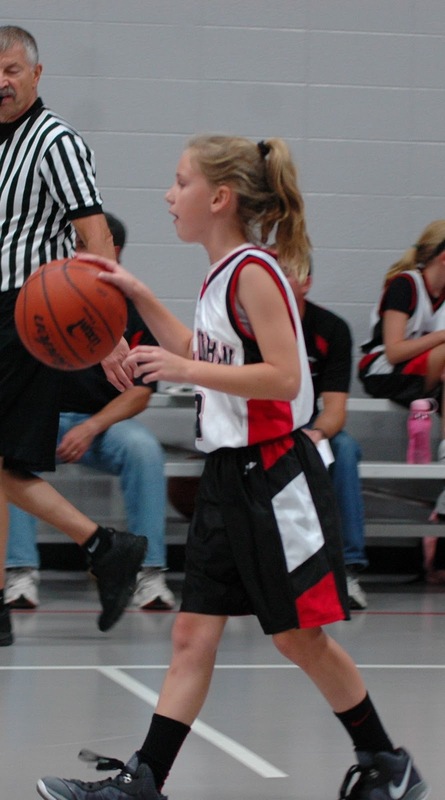 During the regular season, the parish mandated that all players 5th grade and under must play 2 quarters. That certainly makes any playing time decisions easy. 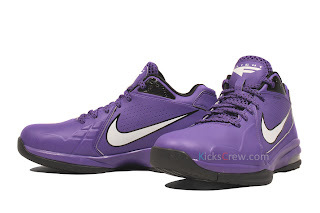 In tournaments, however, each player must play 1 quarter. The team is made up of a mix of experienced and inexperienced players. The 3 most experienced players working together can control and win most games. Due to the parish playing time mandate during the regular season, we rarely had all 3 experienced players on the court at the same time and we ended up a .500 team. If we play all of our girls equal playing time we will likely not advance far in the tournaments (1 to 2 games max). If we play our 3 most experienced players a disproportionate amount of time, we have a chance to advance far in the tournaments (3 to 5 games). So equal time for 1 or 2 games or reduced playing time per game for 3 to 5 games. I truly believe that the inexperienced girls will actually get more playing minutes in the tournament if we play the experienced girls more. More playing time is better for player development. The inexperienced players will also get a better chance to touch the ball in meaningful situations if the experienced girls are on the court breaking presses, drawing defenders and making smart passes. Again, this leads to a better player development situation. The head coach has played the experienced girls more so far in the tournament and the team has advanced to the semi-finals. If we win tomorrow, all of the girls will win trophies and feel like they were a part of something special. So I think you know how I am going to coach this tomorrow. 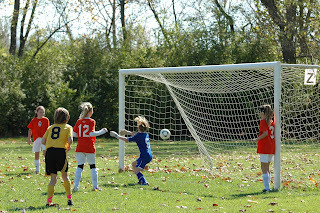 Full discloser - my daughter is one of the 3 experienced players and probably the leading scorer on the team. Three years ago, my wife and another mom helped start the first ever golf team for my son's parochial middle school (6th - 8th grade). That other mom happened to be the mother of one of the top junior golfers in the city, actually the world (finished 7th in the Junior World Championships in 2011). As if that were not lucky enough, one of the parishioners of the church happens to be a PGA teaching pro. These two founding moms convinced this PGA pro to be the coach. Most of the teams have a dad coach, so this was key. The summer before the first year, the coach established clinics for any interested players. About 30 kids, both boys and girls, participated in the clinics. In mid August, the new coach set up a two day tryout tournament to determine the top 9 kids that would represent the school team. The kids who did not make the cut competed against each other weekly. My son and the other founding mom's son made that inaugural team as 6th graders. In fact, an incredible 6 of the 9 players that made the cut that first year were 6th graders. The young team did very well in the first year and gained valuable experience. They came in second in the City. Following year in 2010, they won the Cincinnati City Championship by an amazing 33 strokes. In 2011, they won all 23 matches by at least 11 strokes and repeated as Cincinnati City Champions. Does your school have a golf team? If not, be proactive and go to the administration of the school and start a team yourself. A local pro from a city course may be very happy to help you start a program. The PGA pro who helped established our program had 50 kids participate in the program this year - that is immediate revenue and lots of future golfers. 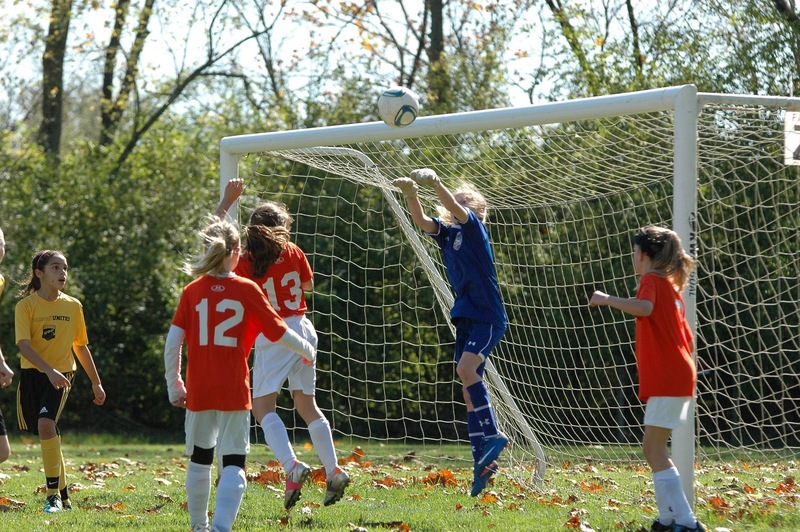 Do you underestimate what young athletes (10 and under) can do and thus limit them? Don't. What does your coach do before a big game, a game your team is not suppose to win? Is he (or she) working himself up into a frenzy yelling at the kids because he's nervous or is he (or she) Zen-like calm a la famed NBA basketball coach Phil Jackson? Yesterday, before the soccer game against the undefeated #1 team in the TPL (The Premiere League - a league made up of some of the very best teams from Ohio, Indiana and Kentucky), the coach of our team strayed from the norm. Instead of bringing the warm-ups to a fever pitch fifteen minutes before the game, he chose to sit the girls on the field in front of the goal for a quiet chat. 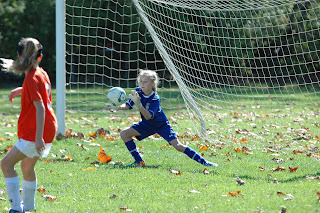 When he called the team over, I had been warming up the goalie, my daughter CC. The warm-ups were not going particularly well because CC was having trouble getting a good grip on the cold slick ball. Quite a few balls were slipping through her hands. Her eyes told me the story, "how can this be happening before this game of all games?" She knew she was going to be tested by one of the best teams in the league. 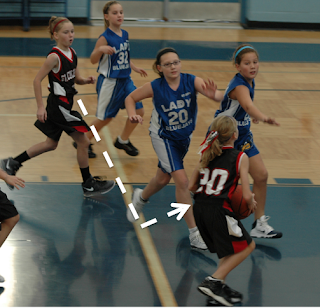 I also think that CC was a bit nervous too because one of her AAU basketball teammates was the star of the other team. When the coach called us over, CC didn't want to go. She wanted desperately to work through her pre-game issues, but I signaled her over to the coach for the pre-game speech. "Girls" he said, "we have nothing to lose today. We are playing the best team in the league. 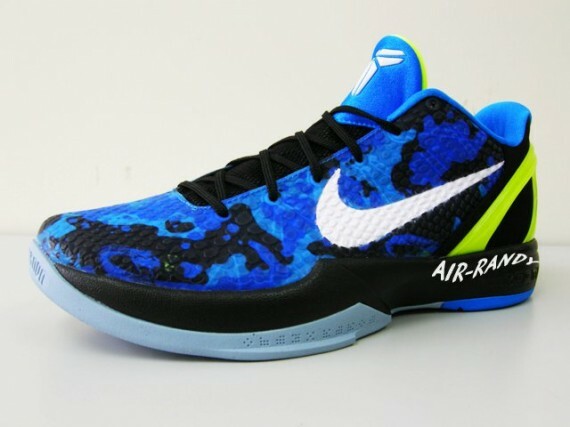 They are undefeated. They are suppose to beat us and they just might. We are going to play our game. We are going to play smart. We are going to play our possession game. We are not going to let them intimidate us or take us out of our game plan. We are going to make mistakes, mistakes that might lead to goals but we are not going to hang our heads down if we do. We are still in school. Still learning. If we make a mistake and they score, we are going to get back up and bring it at them again. We are going to keep working on what we have been working on for the last 5 weeks, possession, possession, possession. That team just lost in the finals of the State Cup in a PK shoot out. 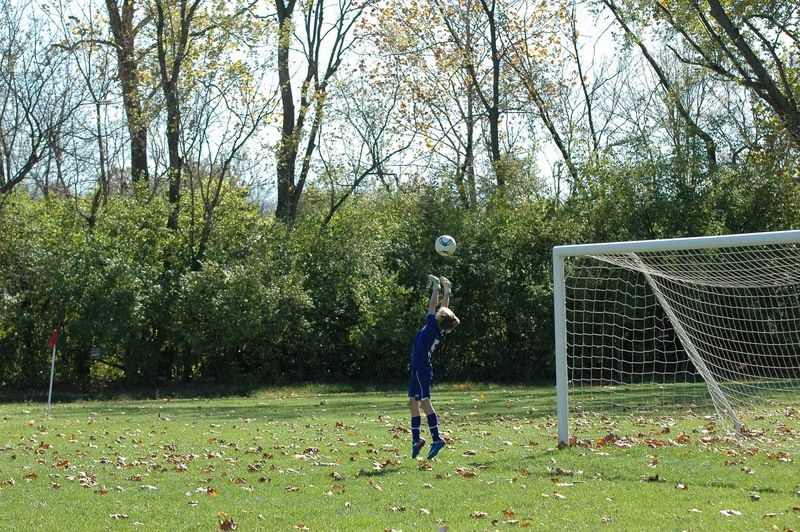 A loss that is going to remind them of our win against them in the last State Cup when we won on PKs. They're going to be upset, so they're going to want to win this game badly. They might win, but if they win we are going to make them earn it. Let's limit the mistakes. Let's leave it all on the field by giving max effort. Give max effort and if you get tired, raise your hand and we will get you a quick rest. 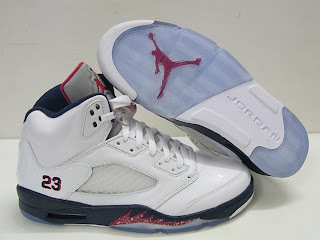 Let's make them earn it." The speech reminded me of the Coaching Alliance Double-Goal Coach course I took this summer before the AAU Basketball National Championships. Specifically, the section of the course called ELM. The E stands for Effort. The L for Learning and the M for bouncing back from Mistakes. Just like win-at-all-cost coaches, Double-Goal coaches want to win on the field, but Double-Goal coaches strive for mastery (getting better) rather than focusing on winning. Winning is a result of mastery of the game. CC's team didn't win, they lost 2-1. They got down 2-0 before the half. The first goal was the result of a mistake. A poor clearing pass hit the back of one of our midfielders and rebounded in front of an opportunistic striker from the other team who rocketed the ball into the upper righthand corner of the net before CC could even see it. 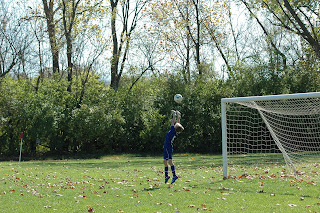 The other goal was an "own goal" off a corner kick. CC was tracking the ball across the goal, but the ball hit one of our defenders in the shoulder and deflected in the opposite direction. But CC and her team made the undefeated #1 team earn it. In fact, CC's team shut down the powerful first place team and scored once to win the second half 1-0. The team gave max E (effort) and bounced back for a few Ms (mistakes). They gave the #1 undefeated team a scare because they concentrated on working on what the team has been L (learning), possession. Today is the 285th day of the year and my two kids have played in 236 games and participated in 137 practices. That's 373 youth sports events in 285 days. My wife and I have logged 13,000 miles just going to and from sports games. I'm not sure how many water bottles we filled and washed or how many loads of uniforms and practice jerseys we have washed. 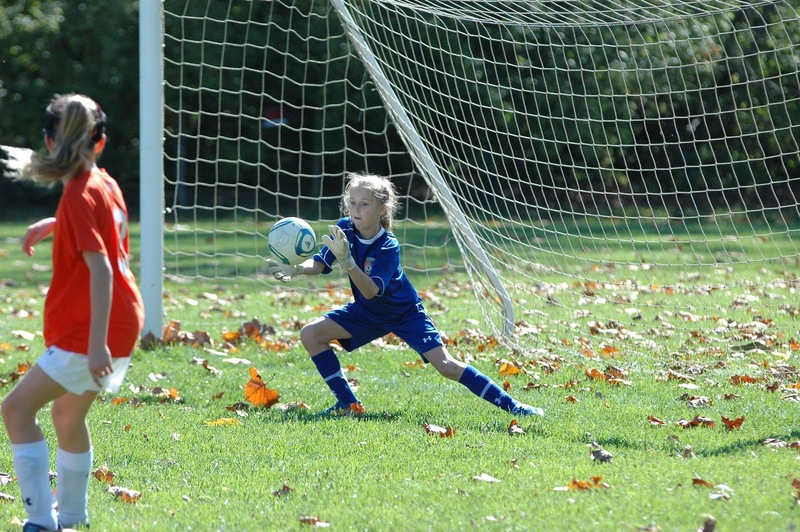 Lots of time and effort goes into our youth sports obsession. Of course, our kids are not just athletes. Both are terrific students and are involved in non-sports extracurricular activities as well. It's pure insanity I know. To do this you need two very dedicated parents with a passion for their kids and sports. My wife and I wouldn't commit to this schedule if we weren't on the same page because a schedule like this could put a strain on a marriage. While we concentrate a lot of time and emotional energy on our kids, we don't forget about each other. We believe that one of the greatest things that we can give our kids is a happy and healthy marriage. My wife and I both came from broken families and know the toll that divorce can take on kids, so we constantly work at our 15 year marriage. Of course it helps that we are both compatible sports nuts. 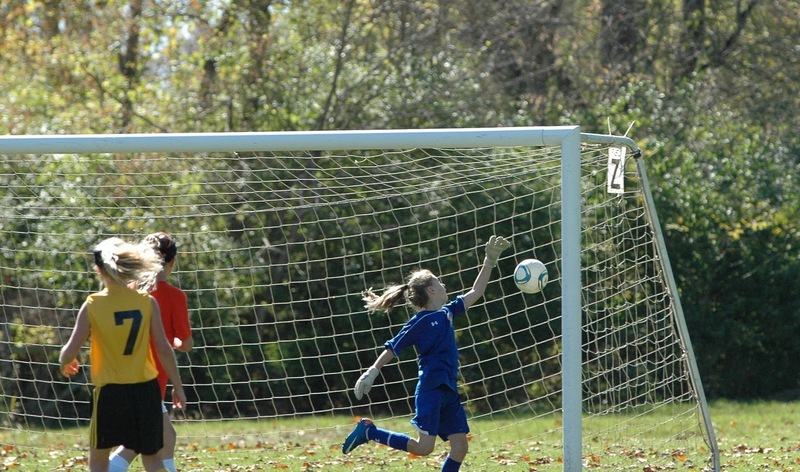 Here's some marriage advice for Crazy Youth Sports Parents. 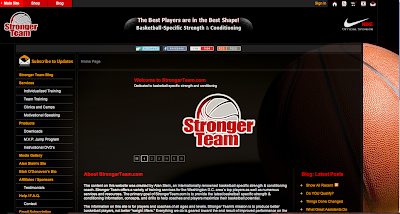 Get on the same page about the sports schedule - jointly decide what to do and not do. And when too much is too much. Go to every youth sports event together to share the memories. Of course, when you have multiple kids you need to divide and conquer. 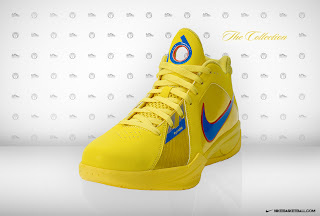 When you are apart, text sports updates or provide play-by-play over the phone. Finally, take a TIME OUT from youth sports and go away alone for uninterrupted time together. This past weekend we took a break from youth sports and drove to Nemacolin Woodland Resort in Western Pennsylvania for a 50 / 25 / 20 / 15 celebration. My two sisters and my two brother-in-laws met us there. My older sister turned 50 and was celebrating her 25th anniversary. My younger sister was celebrating her 20 anniversary and my wife and I celebrated our 15th. We had a great time. We only missed 1 basketball game, 1 golf match and 1 basketball practice. It was actually the State Cup Soccer Semi and Finals weekend. My wife and I rolled the dice that scheduled the weekend thinking that the team was not quite good enough this year to make it to the final four weekend like we did last year. We were right so we did not miss any soccer. 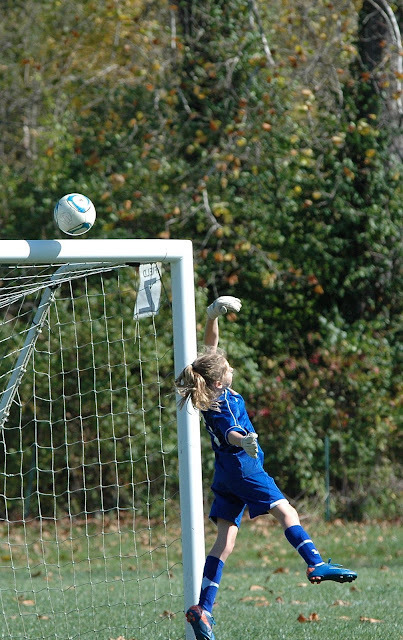 The over-scheduled youth sports world we live in can make life stressful for kids and parents. 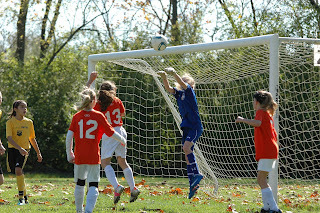 My advice go to as many youth sports games are you can and enjoy watching your kids play. It will all be over before you know it. And periodically take a TIME OUT away from your kids sports schedules and your kids for a couple of hours per week and a couple of days per year to connect with your spouse.